The idea of a bottom loaded vertical for portable operation has been playing around in my head for some time. For many years I used a Little Tarheel screwdriver antenna on my car and loved it. Mobile operation with that was a pleasure. I could tune any band from 80 through 6 meters quickly and on the go. And it worked well. If I could hear them I could work them almost every time and I received good signal reports. It was especially fun to work DX from the car. I think I worked more DX with that than from my home station. So the concept is a winner as far as I'm concerned. The only thing that kept me from actually trying that Little Tarheel as a portable antenna is that it requires battery power to tune it. And that seems like a significant complication when deploying away from the car in the field. It's mobile advantage is somewhat of a portable disadvantage. So when I saw the Wolf River Coils Silver Bullet 1000 TIA, I had to give it a try. 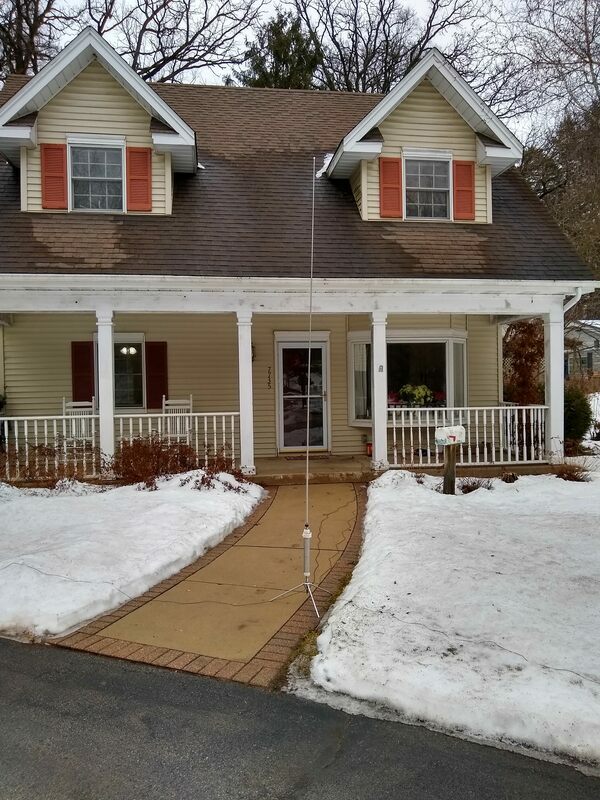 2019-03-03 For the record, I've completed thirteen QSOs with this antenna as of today. All at 5 watts on my end. They ranged in distance from 190 miles to 1284 miles. Nine were on 40 meters, three on 20 meters and one on 30 meters. All but one were using CW. All of this in the dead of winter with a semi-portable setup. 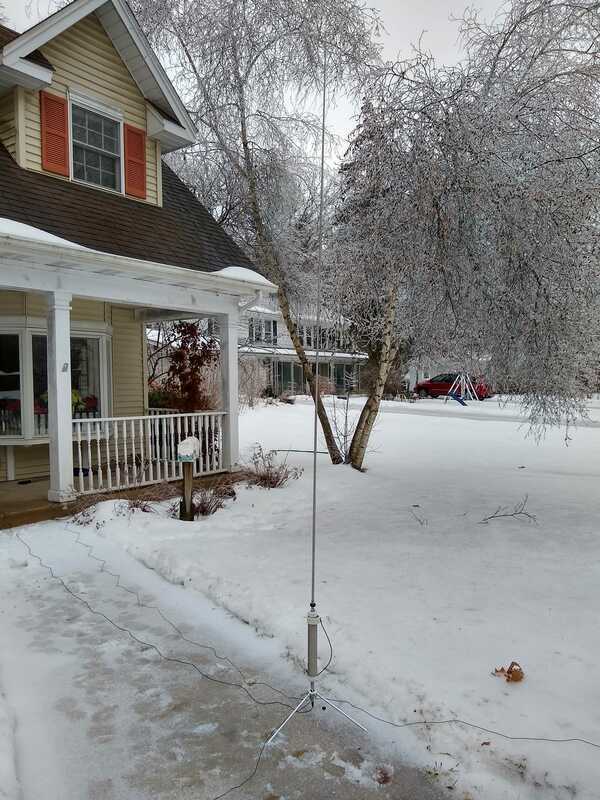 That is, the antenna was out on the sidewalk in the snow and ice while I sat comfortably inside with my battery powered radio at our dining room table, tethered to the antenna with about 35 feet of RG-174 coax. Oh, I just remembered that the first contact as explained below was with the antenna and battery powered radio in our living room so was even more "semi" portable! 2019-03-04 We hit a toasty high of plus ten degrees here in southeast Wisconsin today after an overnight low of about minus six! Winter is being very persistent. But I wanted to play with the Silver Bullet 1000 a bit more and work on finding the places to mark the "ruler" I've added to it described below. I kept my trips outside brief and no more than necessary! I noticed that with the three supplied 33ft radials deployed full length I measured a 1:1 SWR on both 40 and 20 meters. But on 30 meters, 2 to 2.5:1 was the best SWR I could get. It occurred to me that the issue might be the length of the radials. So I shortened the radials to about 25 feet (an estimate) by winding the ends of the radials back onto the winders eight turns. The SWR dropped to about 1.3:1. So clearly the radials should be some length divisible by the wavelength of the antenna at a given frequency for optimal SWR. The supplied 33ft radials are roughly 1/8 wavelength on 80 meters, 1/4 wavelength on 40 and 1/2 wavelength on 20 but "nothing" on 30 meters! I guess I'm not surprised but this reinforces that. Makes me wonder about the optimal length of the counterpoise for other antennas such as the 35 ft. end fed and half wave end fed antennas. My DIY Band marking ruler with temporary band markings on the Wolf River Coils Silver Bullet 1000 TIA. The collar is set for 40 meters. 2019-03-02 One of the inconveniences of this antenna is figuring out where to set the collar for each band. If, for example you are using it on 20 meters and want to change to 40, you will likely run back and forth between your rig and the antenna many frustrating times making first larger then smaller adjustments until you finally get zeroed in. I've seen several ideas including marking the coil with a felt tip marker to help with this challenge. Thinking about it, the idea came to me to attach a plastic "ruler" to the top of the coil form that will hang alongside the coil with markings for the band positions. I found a bright red, tough but flexible plastic file folder lying around so I cut a ten inch strip 3/4" wide. I attached that with a 3/8" standoff to the coil form above the coil by drilling and tapping a 6-32 hole. Finally, I used a black felt tip marker to temporarily mark the collar positions for 20, 30, 40 and 80 meters. I'll experiment a while before adding permanent markings. I want to make sure I have them where I want them. But my first impression with on-air tuning is that it works well. 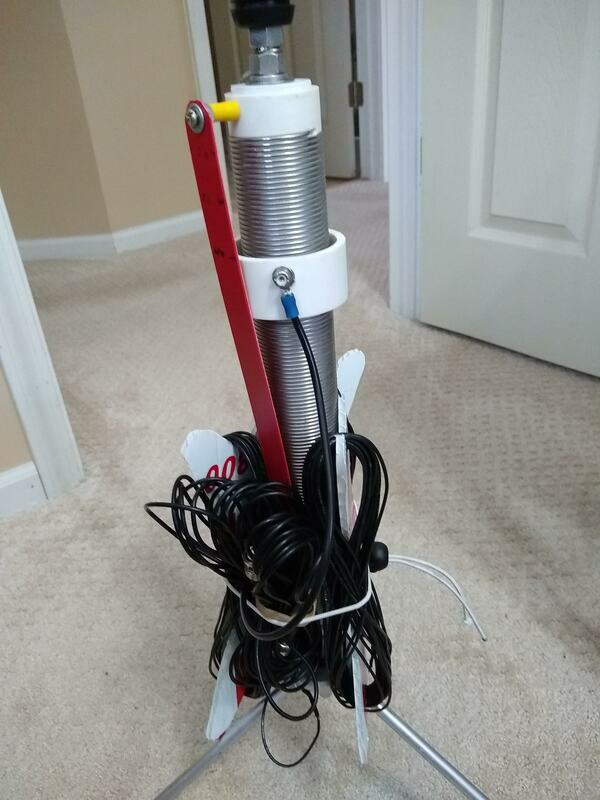 Using this setup with just one trip to the antenna, I was able to change bands from 20m to 40m. That enabled me to have a QRP contact with K3SEW in Pennsylvania who had just finished a QSO. He was 599+ and gave me a 559. QSB was extreme and conditions deteriorated quickly but we exchanged the critical info before things fell apart on us. The photo shows the "ruler" attached to the coil with the collar set for the 40 meter band, as I had it for the QSO with K3SEW. The other two photos show a bit more detail of how I attached the ruler. They also show how I wrap up and secure the feedline and radials for transport without taking the antenna apart. I especially like the DIY wire winders with the radials wound on them in a figure 8 wind which keeps them from tangling, a major hassle with all wire used for antennas. 2019-02-13 I set up the Silver Bullet almost exactly as pictured at right again today (11:00am) and connected it to my x5105. Outside temperature about 17f and everything is snow covered, from 7" two nights ago and 3" last night. Tried 20 meters. A couple signals but no go. Switched to 40 meters and landed one QSO with a station in Indiana (my sig 569, his 559), just a couple hundred miles. Band noise was very low but not many signals on. Inside where I sat at the end of my RG174 feedline, it was 70! This afternoon, around 2:00 I had three more QSOs, one on 40mtrs and two on 20 meters. One of the 20 meter ones was with a station in NM, 1300 miles west. He gave me a 579 and was 589 in here. I like this semi-portable stuff! 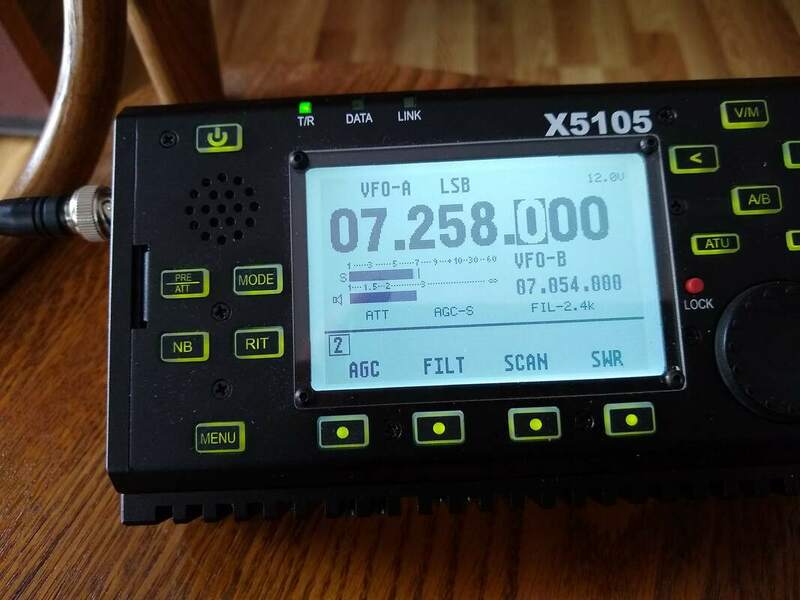 2019-02-06 I enjoy watching YouTube videos and reading posts about portable QRP ventures. But here in SE Wisconsin I'm too much of a wimp to do that right now, even though I have all the toys. Last night we got about an inch of freezing rain and sleet. Temperature is hovering in the mid 20s f. So today I did another semi-portable venture. I was rewarded with three QRP CW QSOs, one each on 20, 30 and 40 meters. The 20 meter one was in New Mexico, 1000 miles. The 40 meter one was with another QRP station in Florida, also about 1000 miles. 35 ft of RG174 coax allowed me to be inside, but in the true spirit of portable I was using my x5105's internal battery! So I felt like I was portable! 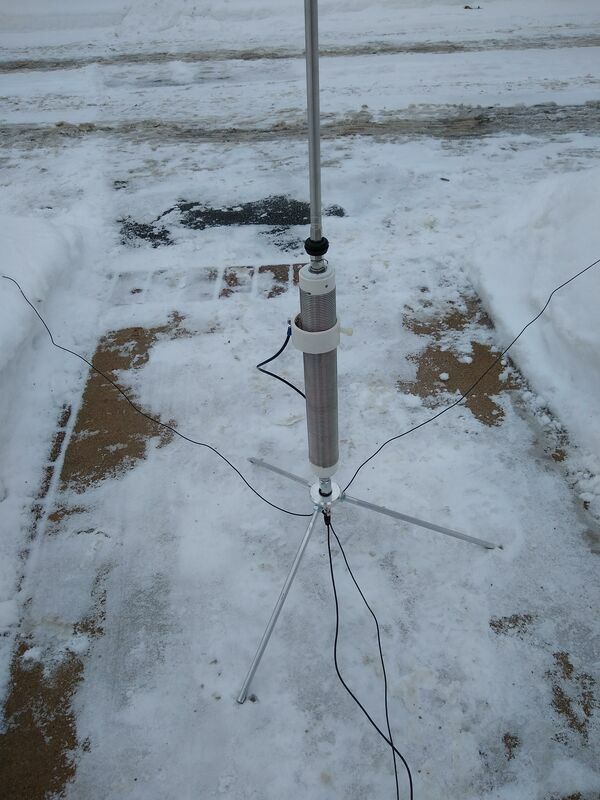 Silver Bullet 1000 set up on the sleet covered sidewalk for Feb 6 and 13, 2019 QRP QSOs. 2019-02-04 I just can't avoid giving into the temptation to do "semi-portable" operations. So, this afternoon I set the Silver Bullet 1000 TIA up on the front sidewalk again and spread the three radials across the fast-melting snow in the yard. It was 41 degrees. 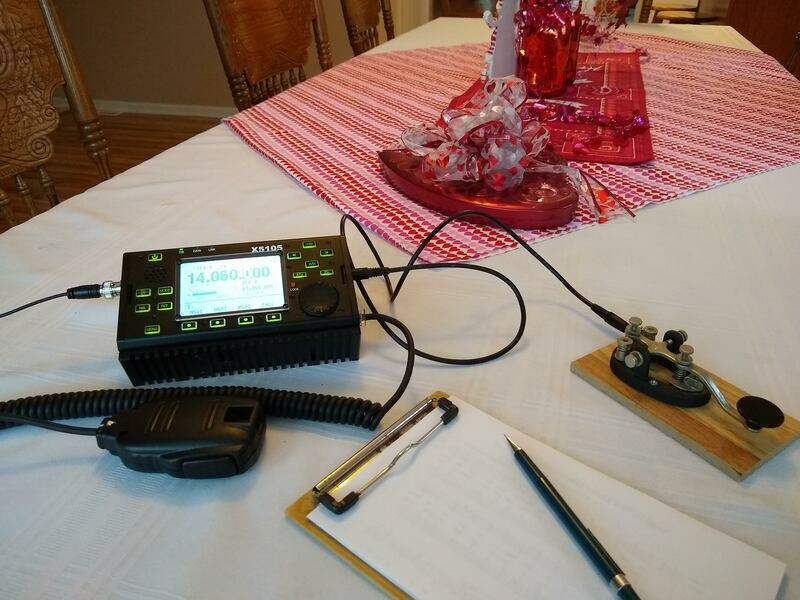 Then I set up my xiegu x5105 QRP rig on the dining room table with the valentine decorations, and had a go. First on 40 meters, I had a CW QSO with a station in Pennsylvania. That one wasn't real good as signals were really poor. I got his details but not sure if he got mine. Next I tuned the antenna up on 20 meters, which simply required moving the tuning collar almost to the top of the coil. SWR was perfect! After tuning around a while I decided to heed the suggestion by VK3YE in his book Minimum QRP by tuning to the 20 meter QRP calling frequency of 14.060 and started calling CQ. After about five calls WA5DSS came back. From 1063 miles he gave me a 569. He was a 579 in here with fairly deep and slow QSB. He was also running five watts but into a beam. Thanks Bill!! We had a solid copy twenty minute rag chew! My semi-portable outing was a success! 2019-02-02 Well it warmed up 60 degrees from yesterday morning to 35 degrees this morning! What a welcome change. 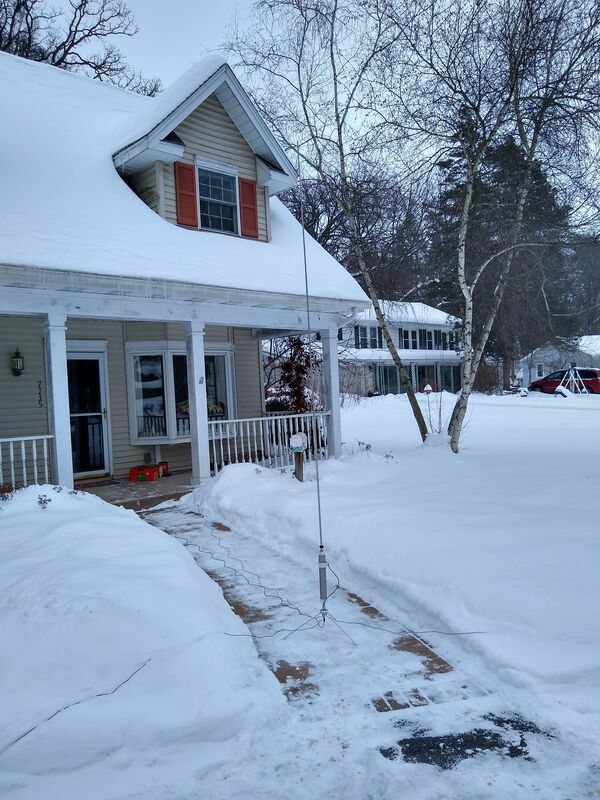 Since it is so balmy, I decided to set up my new Silver 1000 TIA antenna on the sidewalk between the walls of snow, with the three 33ft radials sprawled our across the snow and see what it might do. With the whip fully extended it only took a couple adjustments of the tuning collar to get a low SWR at 7.258, the MidCars frequency. Joe, KC9YTC in Indiana was booming in at 59 so when he called for stations I gave him a call. 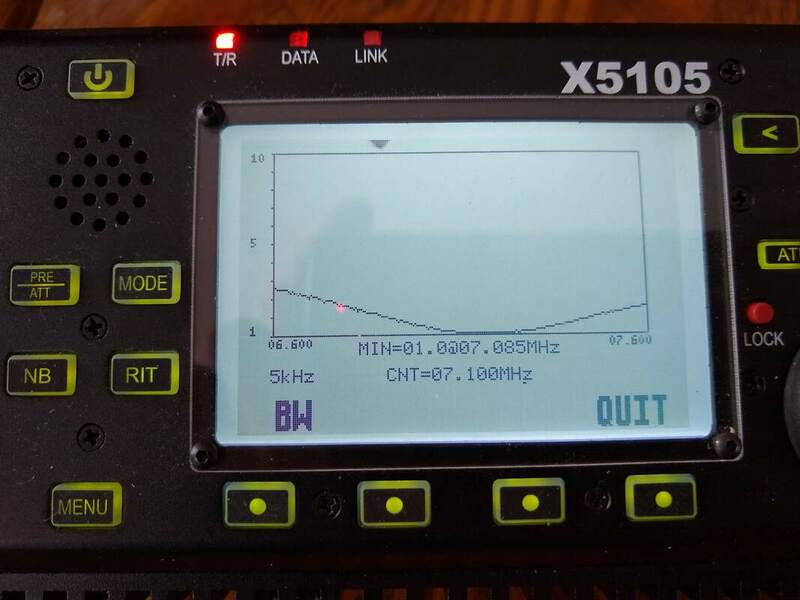 I was using my X5105 5w transceiver. He came back and gave me a 57 signal report! Wow, was I happy! It was about 9:30am CST. Splatter from stations at 7.06 caused us both problems but we concluded a successful contact. The pictures above show the antenna setup, tuning collar position, SWR sweep, rig setup, KC9YTC's signal level and the antenna and counterpoise all ready for the next deployment! My observations from this experiment? 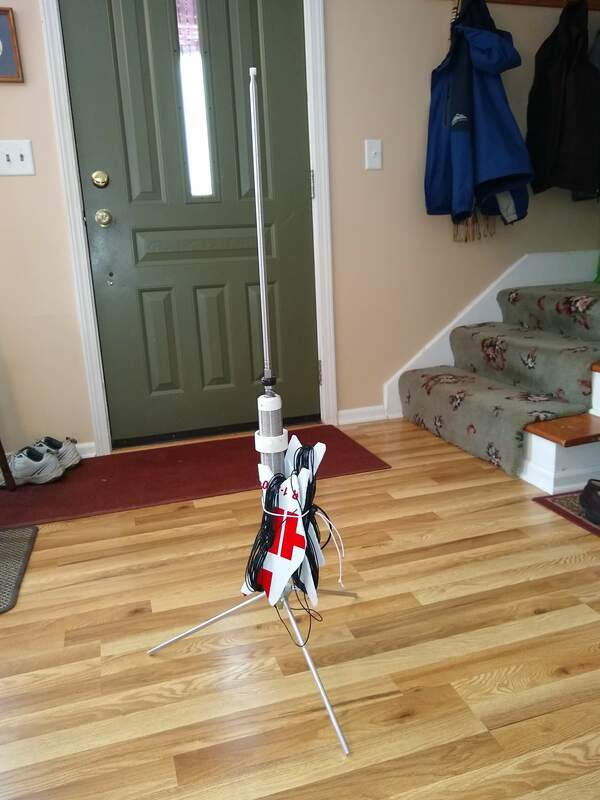 The antenna can be set up quickly, probably about ten minutes. I did do some prep time by attaching the radials and vertical whip prior to taking it outside, so perhaps 15 to 20 minutes total. The integrated tripod is really convenient and stable. Tuning it up is fairly easy. I found the best way is to guess where the collar will need to be which will be much easier after gaining experience with it. Then tune the receiver until you find a peak or near peak noise level. At that point the X5105's SWR analyzer function really shines. Just hit the SWR button, adjust it to sweep 5 khz and pay attention to the direction of the sweep which will indicate whether the best SWR is higher or lower in frequency. Then make changes in the collar position until the resonant point is where you need it to be. I tend to think of verticals as a compromise antenna since they radiate in all directions and having a low take-off angle making them better for distant than closer end stations. So I was a bit surprised by the strength of Joe's signal given he is just under 300 miles southeast. W0UZR 400 miles northwest in Minnesota was also very strong. Other stations checking into the net were all over the place signal strength wise. With just one QSO I really can't conclude much about the antenna's performance but it appears to work well. That's not surprising given my very happy experience with the very similar design Little Tarheel antenna on my car. The antenna is not the lightest one for portable use at 53 oz (3-1/3 lbs) and is bulkier than some of my stealth portable antennas. but for just about anything other than longer distance backpacking, it looks like a winning combination of convenience, performance and weight/bulk. I'm excited about it. 2019-01-31 The temperatures here in SE Wisconsin are still ridiculously low, (-25 at my house overnight) so no outdoor trials of my just acquired Silver Bullet 1000 TIA. But I have been tinkering with it. One concern I have is that with the twelve inch tripod legs and a 10" whip attached it might be top heavy in a windy location. 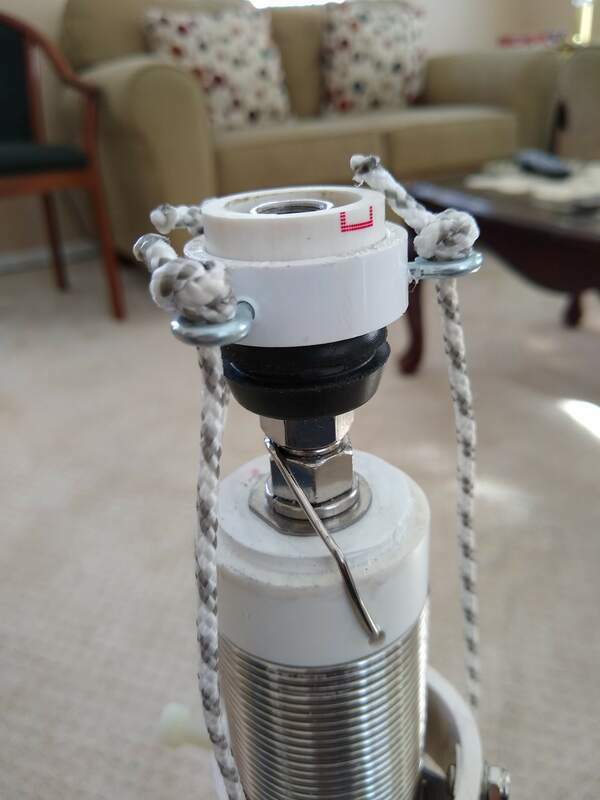 I have a couple guy rope collars for use with my push up fishing poles for use with my end fed, trap, fan and link inverted vee antennas so I decided to come up with an easy way to use one of those collars when needed. 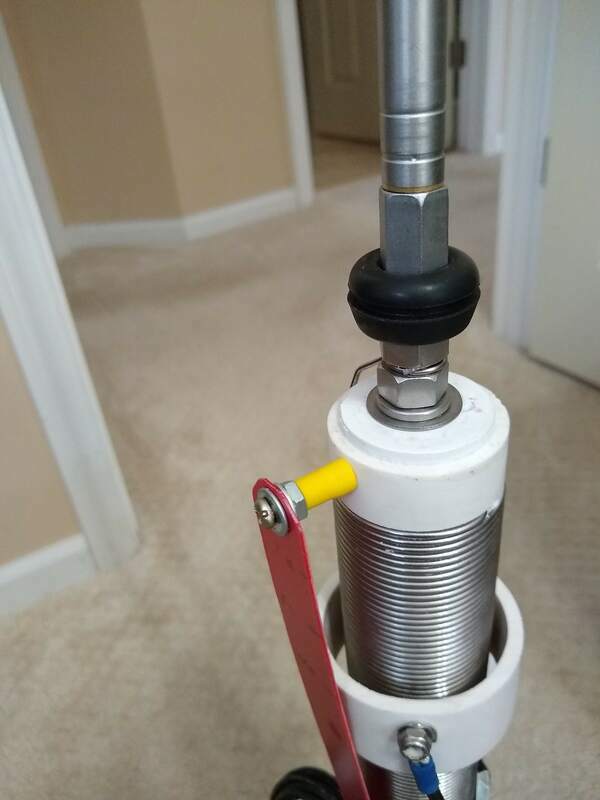 My solution, pictured below is to push a 3/8 inch rubber grommet over the coupling at the top of the Silver Bullet 1000 coil. My collar then sits on top of that grommet and should hold the tripod firmly in place without interfering with the normal operation of the coil. That allows me to utilize the collar and guy ropes I already have without any modification to either the collar or the antenna. And the only cost was the grommet, just under $4 with tax. Seems like a win! 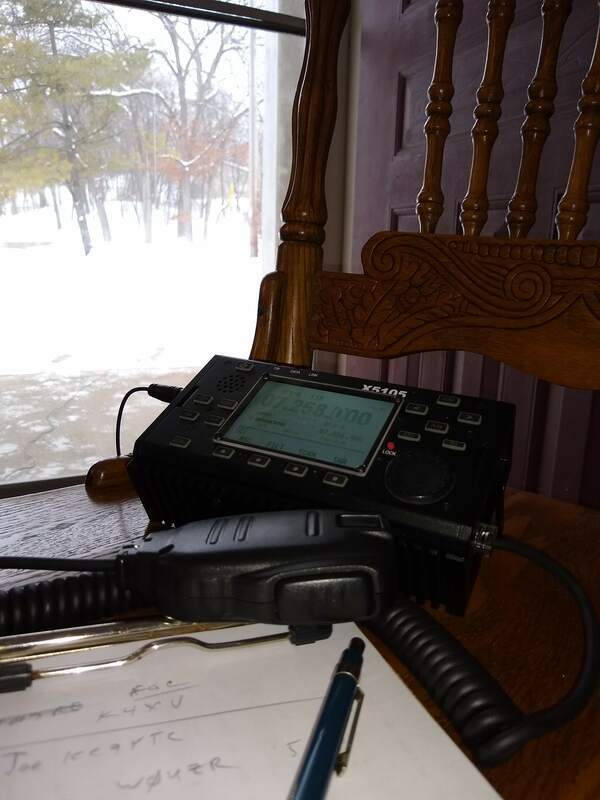 2019-01-28 Several weeks ago I came across a video by K8MRD on YouTube using the Wolf River Coils Silver Bullet 1000 TIA antenna on a POTA (Parks On The Air) activation. He made the interesting point that though he likes to use a speaker wire inverted vee on such outings, when the ground is frozen, that is less user friendly. I was captured by the antenna as looked very similar to my Little Tarheel, minus the motorized tuning! One of its appeals is that it comes with its own tripod making it a self contained free standing antenna package. I've played with portable verticals before, building a Pac-12 vertical several years ago. Overall I liked it but mine was way too flimsy and hard to tune with my home made coils, etc.. 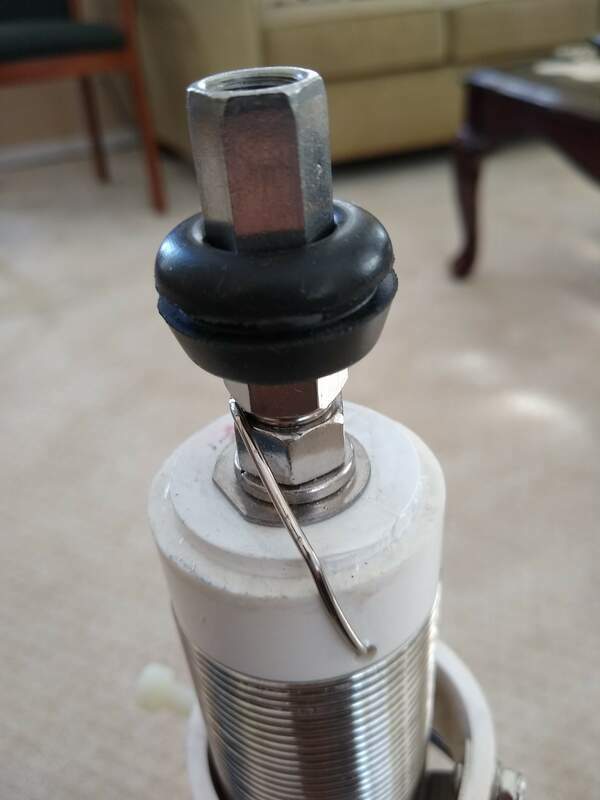 When I thought about trying to use it for Field Day this past June the aluminum rods, steel couplings and brass bolts had "stuff" growing on them and I couldn't get good electrical connections without a lot of work. I ordered a Silver Bullet 1000 TIA a few days ago which came today. The collapsible whip seems sturdy but I was concerned that several of the sections move quite easily making me wonder whether wind battering it might cause it to slip a bit. I suspect after you use it a while and get a little dust on it things will be fine. Neither of these things are big concerns, just observed. Also, the tuning collar on the coil is kind of hard to move but that keeps it from being accidentally moved. Overall I am pleased with it. The weather is far from human-friendly here in southeast Wisconsin right now so it'll likely be a while before I get to check it out but I'm impressed with it physically and am anxious to give it a go. In the mean time I'll go back to my trusty old G5RV and have some CW and SSB QSOs! I may even hook up my magnetic loop from time to time as well just to keep my portable operating dreams alive. After looking at the Silver Bullet standing in the corner for a few hours, I just couldn't resist. So I set the antenna up in our high ceiling living room with just one of the three supplied radial wires attached and using my Xiego x5105's antenna analyzer was able to tune it to a 1:1 SWR on 40, 30 and 20 meters. Hand capacitance was a real issue but otherwise it tuned well. 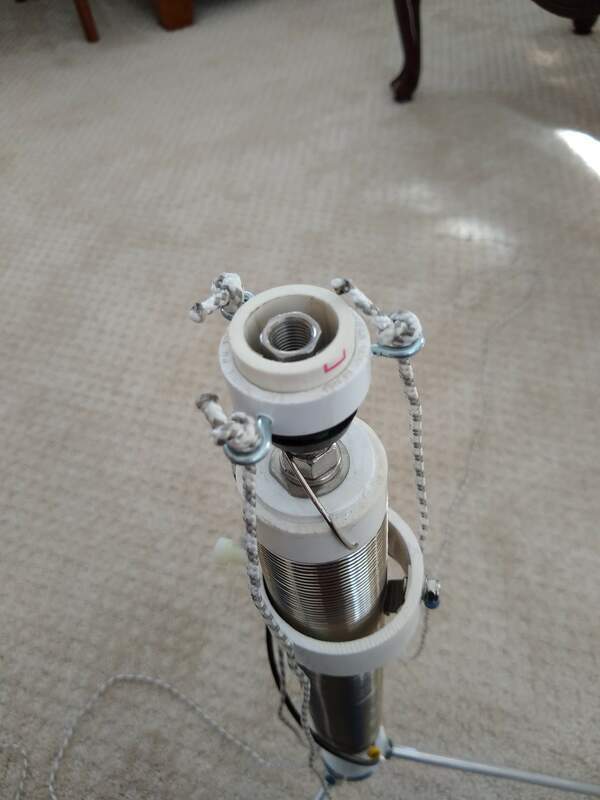 2019-01-29 This afternoon I just couldn't stand it any longer so once again I set up the the Wolf River Coils Silver Bullet 1000 TIA antenna in our living room. This time I attached all three radial wires as best I could. One stretched across three rooms to its full 33 ft length. The others I just unfurled as far as I could in two other directions. They were each probably about ten feet long. I left the coil as I had it last evening when playing with it on 40 meters and pushed the whip up to the ceiling, about nine feet. 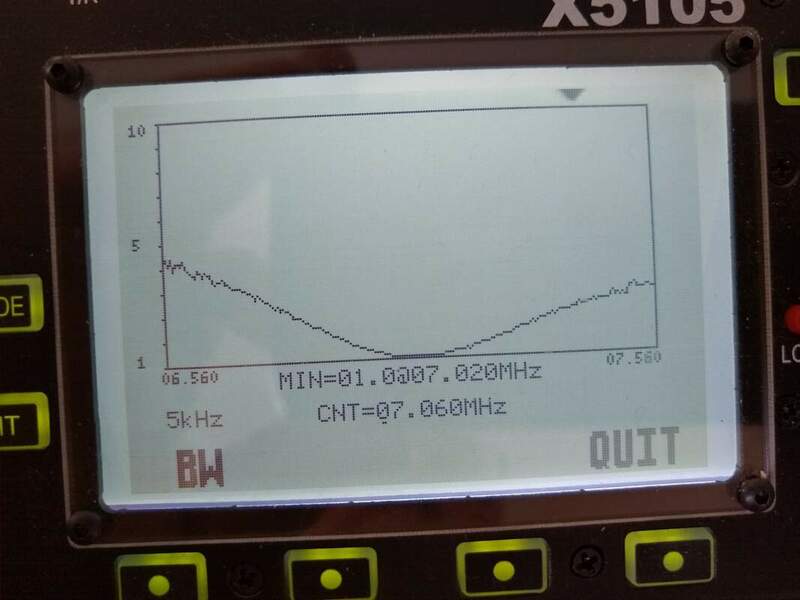 My Xiego x5105 antenna analyzer showed a 1:1 SWR at about 7.02mhz! The SWR plot is shown in the photo at right. So just for fun I tuned around the band and heard K3Y/0 calling CQ on 7.051. It took a couple times and many repeats but he heard me and we logged a contact. he gave me a 339 and he was a 579 from 424 miles. It Works! And I'm sure with the radials stretched out as they should be it would work even better. The hand capacitance effects I noticed last evening were not present today. I'm guessing that is thanks to all three radials being attached. My station for the contact on 40 meters with K3Y/0 in Lenexa Kansas. X5105 at 5 watts, Silver River Coils Silver Bullet 1000 TIA and poorly deployed radials in our living room! SWR reading of the Wolf River Coils Silver Bullet 1000 TIA set up indoors with poorly deployed radials. Now I really can't wait 'till the weather warms up a bit. Tonight it is supposed to hit -28 or so! And tomorrow clear up to about -10. So it won't be tested outdoors in the next two days for sure!